Kat Stanford is just days away from starting her dream antique business with her newly widowed mother Iris when she gets a huge shock. Iris has recklessly purchased a dilapidated carriage house at Honeychurch Hall, an isolated country estate located several hundred miles from London. Yet it seems that Iris isn’t the only one with surprises at Honeychurch Hall. Behind the crumbling façade, the inhabitants of the stately mansion are a lively group of eccentrics to be sure—both upstairs and downstairs —and they all have more than their fair share of skeletons in the closet. As Iris’s past comes back to haunt her, Kat realizes she hardly knows her mother at all. 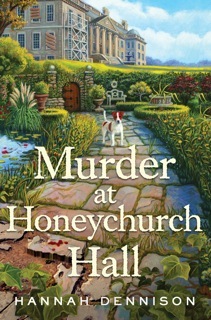 A when the bodies start piling up, it is up to Kat to unravel the tangled truth behind the murders at Honeychurch Hall. I knew before I finished the first chapter I was going to love this story. Iris is a very independent woman especially now that her husband has passed away. She also has a couple of secrets. Her relationship with her daughter Kat reminded me so much of my relationship with my own very independent mother. All are stubborn women and hate having anyone tell them what to do. The dialogue between Iris and Kat was spot on and at time absolutely hilarious. Kat has come to Honeychurch Hall to help her mother but to also find out why she left London and where this leaves their plans to go into business together. Kat has left her job on the telly for a few reasons but she thought she was leaving to follow her dream of opening an antique shop. Her mother can’t seriously want to live in this broken down carriage house surrounded by a bunch a crazy people. The nanny has already left, the child has quite the imagination, he pretends he is Biggles, is a fictional pilot and adventurer, and spends his days chasing down missing pilots and hiding from the enemy. The matriarch of Honeychurch Hall may be in the early stages of dementia or is she just trying to pull one on her family. Her son has his own ideas on what to do with Honeychurch Hall. The maid had a heck of a shoe obsession and she is the one Kat finds dead in the garden tunnel. There is so much happening in this story. We meet some very extraordinary characters and they are all twisted into an incredible mystery. This story was a pure joy to read. I hated to see it end. I can’t wait for the next one. Write fast please Hannah!!! I am putting this one on my t-b-r list right now! I really enjoyed this one too, Lori! The mix of humor and seriousness, the eccentric but believable characters, and the way Dennison brings contemporary England alive are all delightful. And Hannah Dennison confirmed that there is a sequel coming – yay!